This is the first book to explore what happens when patterns originally created to cope with family conflicts are unleashed in the workplace. Crossing the personal growth and leadership genres, it helps readers dramatically improve their professional relationships by taking control of the underlying family patterns that so frequently stymie them. Drawing on material and experiences from Total Leadership Connections, her highly successful leadership retreat program, Lafair presents the unproductive work behavior patterns that grow out of early family relationships (often going back many generations) and provides readers with the tools they need to break free. Written in a brisk style and offering a wealth of real-life anecdotes and practical, workbook-style exercises, the book teaches readers that it's possible to get beyond old, outmoded attempts at conflict resolution and empower themselves to make profound differences both at work and in our personal lives. Throughout the book she offers quick, practical and effective tools and exercises to breaking free of these patterns, without years of therapy. Decoding Office Politics - Finally! During my 20 years as a corporate trainer and OD consultant, whenever I discovered a book that I thought would change the lives of my participants, I'd add it to my bibliography of recommended reading. "Don't Bring It To Work" is one of those rare transformative books. At a time when our awareness is shifting and we are recognizing the importance of letting go of the past, Dr. Lafair guides us through a process that enables us to untangle the "nots" that keep us anchored to the often unconscious behaviors and patterns that block our ability to be completely present, in the moment of now. What an amazing gift that is! It is rare, if not impossible for any human being to have not been impacted by family patterns and messages, both implicit and explicit. Sylvia LaFair offers in depth explanations of how family systems impact our adult relationships particularly in the world of work. Her examples and stories are relatable, poignant, and strikingly familiar to anyone engaged in organizational life. She also offers a definitive pathway to transforming old patterns into new ones that add value, increase authenticity, and help potentialize talent. A key to being a great leader is to first understand yourself and then do the necessary "clean-up." 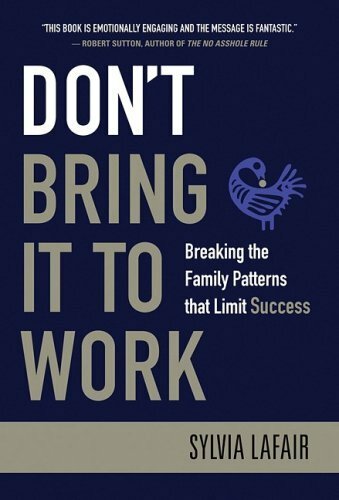 DON"T BRING IT TO WORK helps the reader take an honest assessment of his or her behavior and then offers tools and rules to help foster trust, creativity and vitality. Sylvia Lafair is a master guide who has written a book about transforming our personal and professional relationships. This book contains the writing of a gentle and insightful soul who does not bog you down in analytical dryness, but speaks to and teaches from the heart. Genuine vision and humanity in the workplace are a rare and valuable gift, and readers will find both in this work. With the aid of this book's grounded wisdom, we can untangle the knots of our own making and find our way clear in any relationship of significance, no matter how challenging it might be. This book provides a useful guide through which the reader can both look at the vast array of human patterns present in the work place and the author's helpful directions/suggestions for change. Sylvia Lafair is at the leading edge of the new wave of deeper and more profound approaches to what makes relationships work. Her keen insights into what makes business relationships work are greatly needed. I highly recommend this book!